Wunderlist is a great to-do application that is cross platform. 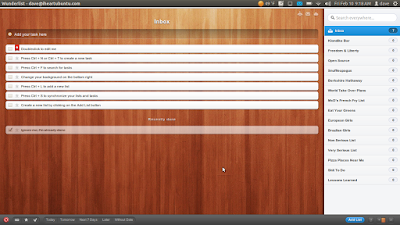 For previous Ubuntu users using 10.04, 10.10 and 11.04 Wunderlist can be found in the Ubuntu Software Center. For 11.10 Oneiric users (64 bit), Wunderlist dropped the ball on us. Its been 4 months now without Ubuntu support for Oneiric users (my guess is that they are busy on a newer app with more features). There is a way to install Wunderlist in 11.10 – 64 bit, but you’ll have to follow the terminal commands below. Its not too difficult if you go slow and follow along. Open a new Terminal and copy and paste the codes into the terminal and press ENTER after each one. You should now be able to open the Unity dash and type Wunderlist to find the app. Click and it should open.